We carry out topographic beach profile surveys at over 100 beaches around the South West coast, using RTK GPS, which is accurate to ~30mm. A minimum of two GPS receivers, linked by radio, are required. One receiver acts as a base station, providing corrections, the other is a mobile station used for the collection of data. The main advantage of GPS over other techniques is in the speed of data capture. In some instances GPS equipment can be mounted onto a moving vehicle such as a quad bike for even faster data acquisition. We survey profiles at fixed intervals along the beach in the spring and autumn at the majority of sites. Sites which are deemed very low risk will be surveyed only once, in the spring. These profiles allow us to calculate the cross-sectional area of the beach and to identify areas of change. Every five years, at the beginning of each new phase of the Programme, we carry out a more comprehensive survey at each of our sites to establish a baseline. These baseline surveys involve measuring spot heights along the entire beach at a minimum of 5m intervals and surveying beach profiles at 50m intervals along the beach. The spot height data can be used to create digital elevation models of the beach which are then used to show how the shape of the beach is changing over time. High risk sites, or those with a beach management plan receive a repeat baseline during the summer each year. All our surveys extend from the back of the beach to the level of mean low water spring tides, to ensure we consistently cover the same area of the beach and to maximise the amount of beach we are able to survey. Thousands of beach profiles will be collected during the course of the Programme, allowing us to build up a large, consistent, quality controlled dataset. We issue annual reports on all sites that we survey containing analysis of the data we have collected. These can be downloaded here from the National Coastal Monitoring website. Follow the link to the map viewer and data catalogue to download topographic data. An example of data points collected during a baseline survey (left), interim beach profile surveys (centre) and post-storm surveys (right). Small brass markers with the letters EABM on their surface have been positioned in hard structures along the coast. These are part of a series of over 150 GPS surveyed points which make up the Programme's ground control network, to which all our surveys relate. Established using GPS observations, the network ties in with the primary Ordnance Survey network which replaces the bench marks previously used with more traditional survey methods. Location diagrams for each marker can be downloaded here. After major events such as big storms, we carry out post-storm beach surveys. These are typically along a reduced number of profiles at the most vulnerable points along the beach. These profiles are agreed with the engineers responsible for each beach in advance. 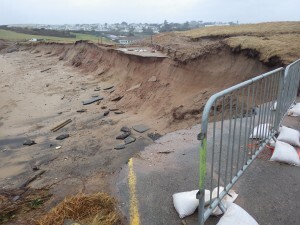 The number of post-storm profiles at a site can change to reflect areas of damage to the beach. We aim to have surveyors on site within 24 hours of a storm event, where conditions allow. We aim to capture as much of the profiles as we can safely, so it's unlikely profiles will be able to extend as far out as mean low water springs level. The data is quickly processed and supplied to operating engineers to make sure they have the most up to date information to make informed decisions on the management of the beach following a storm event.